A road-embedded recharger developed by the Korea Advanced Institute of Science and Technology was picked as one of the 50 Best Inventions of 2010 by Time magazine. KAIST's wireless power supply strips are embedded in roadbeds to transfer energy to battery-powered electric vehicles running above. 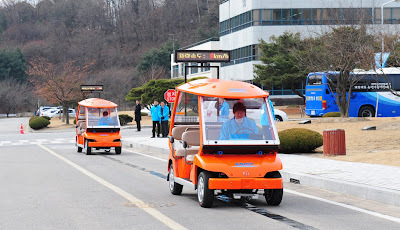 A prototype is now in service at the Seoul Grand Park in Gwacheon, Gyeonggi Province. Also on the list are the Apple iPad and Google's driverless car, as well as an English-teaching robot developed by the Korea Institute of Science and Technology.